Park Bo Gum and Song Joong Ki Relationship Going More Stronger? Sudden Appearances of Song Hye Kyo’s Partner In Various Fan Meets Affirm Secret Affair? The controversial relationship of Park Bo Gum and Song Joong-Ki is crawling over to the walls of online media permanently as it is quoted more than just plain “bromance” or maybe it is. Since the time Song Joong-Ki posted his and “friend”, actor Park Bo Gum’s photo on Valentine’s day instead of him and Song Hye Kyo, fans all over the world are in a fog of spontaneous questionnaire and we don’t blame. According to AllKpop, Park Bo Gum’s fan meet (26,000 fans) conducted in Singapore and Taiwan was attended by Song Joong-Ki secretly. May fans pointed out that Park Bo Gum was emotional and wasn’t able to hide his feelings as Song Joong-Ki accompanied him in his fan meet. 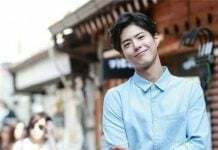 Other fans speculate that Park Bo Gum looks upon Song Joong-ki as his elder brother and a mentor who is also helping him in his career development. On the other hand, Song Joong-Ki mentioned: “I am very happy to be able to go on Park Bo Gum’s Asia Tour. Please continue to love and support him; it would be greatly appreciated” in one of his fan meetings recently. This statement of Song Joong-Ki has raised more questions than before on their rumored love affair. 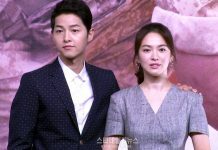 Another news of Song Hye Kyo’s and Song Joong-Ki’s ruptured affair due to Park Bo Gum and Song Joong-Ki’s growing relationship was reported by Korea Portal. Other reports of Park Bo Gum’s display of jealousy surfaced when Song Joong Ki paid tribute to Song Hye Kyo during the recently-concluded 29th PD Awards. Looks like there is a love triangle. Stay tuned with us for more updates on the story. Keep up! Previous articleLee Min-Ho Accepts Reunion With Park Shin Hye Through ‘The Heirs 2′? Star Jealous of Lee Jong Suk, Suzy Bae?